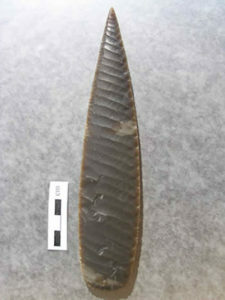 Edge-to-edge pressure flaking is a difficult technique that is rarely used by today’s modern flintknappers. Here are some superb examples of this unique style of pressure flaking. All the edge-to-edge biface’s shown here were knapped from spalls or nodules. 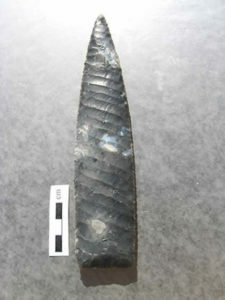 This biface is made of heat-treated Texas flint. This biface is made of non heat-treated Danish flint. 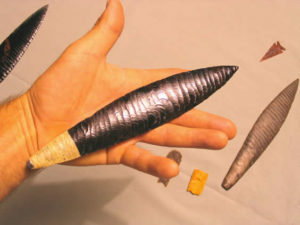 This dagger is made of Lizard Skin Obsidian (from Glass Buttes, Oregon). 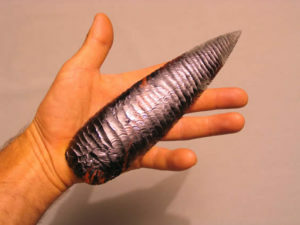 It is 21.5 cm long. This beauty is made of Midnight Lace Obsidian (from Glass Buttes, Oregon). It is 20.5 cm long.